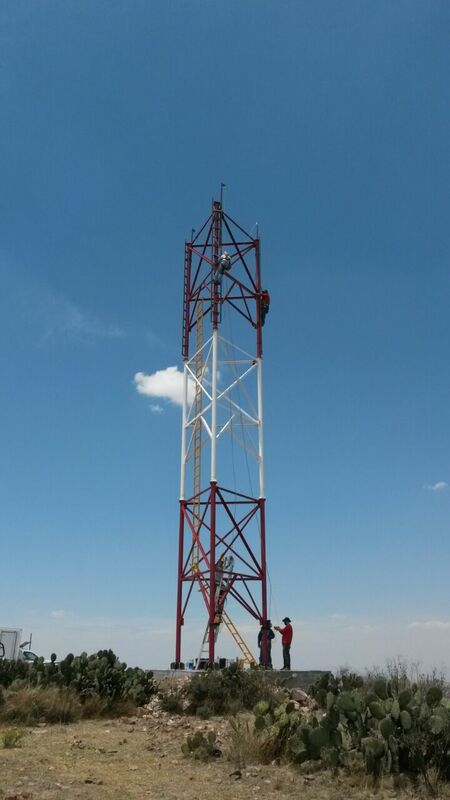 A new Digital TV transmitter is transmitting on Channel 44 NTR in the city of Zacatecas (Mexico). Cable AML has supplied channel 44 NTR with a complete RF transmission system including encoders, a microwave link transporting the digital signal from the Studio to the transmitter site, the UHF high power Transmitter and the transmission antenna. The ATSC transmitter delivers 1.7 KW RMS power. The encoder accepts two SDI/HDMI input signals from the studio in downtown Zacatecas and translates them to ASI format. The STL (Studio to Transmitter Link) transports the ASI signal to the transmitter site at a distance of several kilometers. The transmitter is fed the ASI signal directly from the STL receiver. The STL link also provides two-way IP connectivity between the two sites, which can be used amongst other things to connect the remote monitoring ports of the transmitter. According to Ing. Mario Torres, “We are very happy with the quality of the hardware supplied and the excellent support received from Cable AML, which made it possible to install the system and start transmitting in a very short time”. 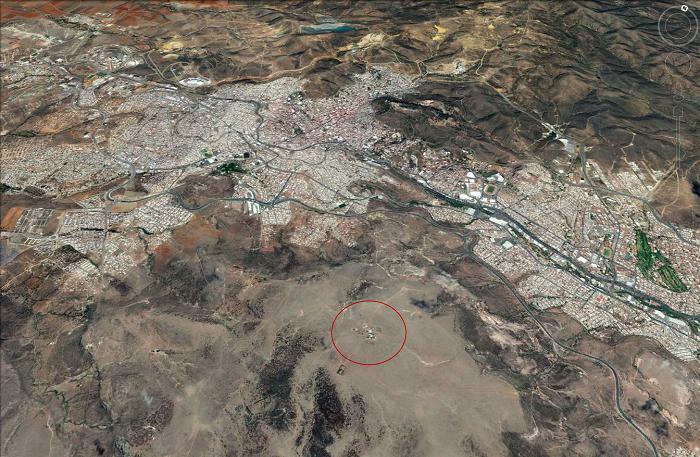 A new UHF Digital TV channel started operation as Channel 20 in the town of Zacatecas (Mexico) with a transmission system designed and delivered by Cable AML. The system delivered by Cable AML covers the complete RF transmission system from the Studio to the transmitter antenna. 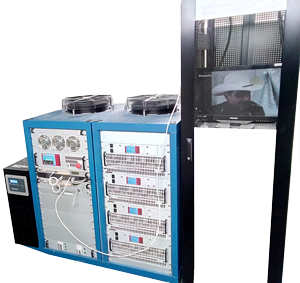 The system includes digital encoder, STL (Studio to Transmitter Link), UHF Transmitter and transmission antenna. The ATSC transmitter delivers 1KW RMS power. It incorporates state-of-the-art adaptive pre-correction technology to achieve high MER at high power while minimizing thermal stress, resulting in a rugged design with outstanding reliability and durability. It also comes equipped with multiple types of ASI input interfaces.This transmitter has an overall efficiency of over 40%, allowing for very efficient operation at low recurring cost. It incorporates a full set of control and monitoring features accessible via local touch screen or by remote control via SNMP or Web Interface. The encoder accepts SDI/HDMI inputs from the studio and translates them to ASI format. Its modular design allows for additional slot for multiple input programs. The STL transports the Ai signal to the transmitter site, located on a high hill. The antenna system was configured to provide signal coverage tailored to the distinctive demographic and topographic profile of the city. According to Mr.Armando Carrillo, “we are very happy with the quality of the hardware sup- plied and the excellent installation and commissioning support received from Cable AML, thanks to which we were able to install and start transmissions in a very short time”. 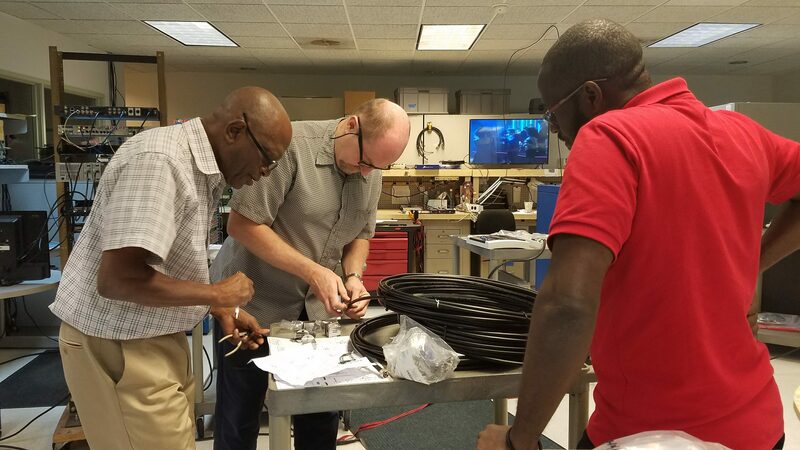 ABS Television, the leading TV and Radio Broadcaster in the Caribbean nation of Antigua and Barbuda is in the process of upgrading the existing TV broadcast system from Analog to Digital. The project is under the direction of the Ministry of Information, Broadcasting, Telecommunications and Information Technology, headed by Minister the Honorable Melford Nicholas, and the ABS General Manager Mrs. Erna Mae Brathwaite. 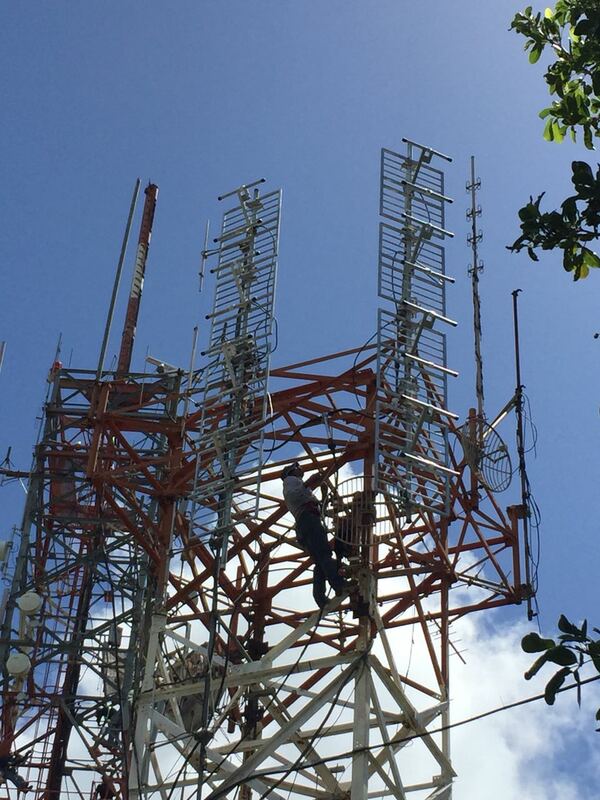 phase of the project, which includes installing a two-way digital STL between the Studio in Antigua, the TV transmission antenna and the DUAL CAST TV Transmitter at Boggy Peak. With the STL in place, ABS can transmit in analog during the transition period and then switch to digital transmission without changing any of the hardware, under the direction of the Project Manager, Mr. Auckland Edwards and the Project Engineer Marlon Carr, with assistance from the Director of Technical Services Trevor Parker, Personnel from ABS Television, have concluded the first phase of the project. Following the switch to digital TV transmission from Boggy Peak, a second STL link will be installed between Antigua and Barbuda (60 Km) to provide a two-way video and IP data transmission between the two islands. 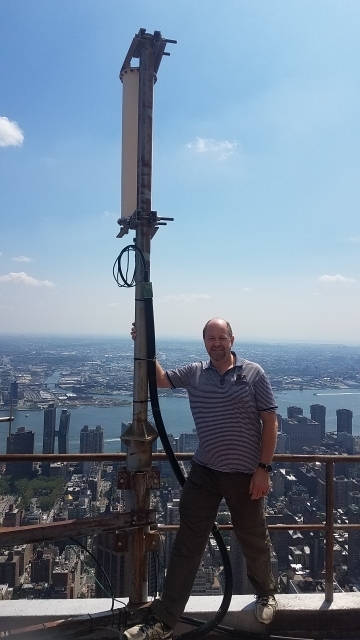 Cable AML has delivered a Digital Transport and Broadcast Network transmitting four HDTV programs in dual DVB-C and IP formats for installation in New York State. The system headend accepts four HD- SDI feeds from a TV studio and generates two outputs, in IP and DVB-C formats respectively. The DVB-C carrier is 64QAM modulated and broadcasted through omnidirectional antennas with coverage of 25 Km radius.The same 64QAM signal is re-transmitted over the air at a total distance of over 100 Km using repeaters at relay stations, each of which reproduces the omnidirectional broadcast pattern of the first transmitter. The IP-formatted signal is transported through conventional fiber-based networks and fed to isolated transmitters for rebroadcast in DVB-C format.The system design approach is modular, so as to allow for future expansion of the number of TV programs transmitted, the number of relay sites or the number of receiving stations.